The Republic of Zaire was the name of the present Democratic Republic of the Congo between 27 October 1971, and 17 May 1997. The name of Zaire derives from the Portuguese: Zaire, itself an adaptation of the Kongo word nzere or nzadi, or "the river that swallows all rivers". Known as the Belgian Congo up until its independence in June 1960, unrest and rebellion plagued the new government until 1965, when Lieutenant General Joseph-Désiré Mobutu, by then commander-in-chief of the national army, seized control of the country and declared himself president for five years. See Congo Crisis. Mobutu quickly consolidated his power and was elected unopposed as president in 1970. 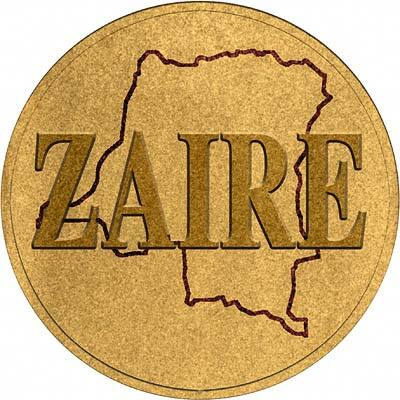 For silver and base metal coins of Zaire, please look at our original Chard Coins website. We make an active market in almost all world coins, gold or otherwise, including Zaire gold coins. If you have any of these coins to sell, please contact us, or post them to us for appraisal and offer.